Guayaquil, Ecuador is typical of many burgeoning Latin American cities. The city, with a metropolitan population of approximately 2.7 million persons, has limited funds for highway construction, an underfunded public transit system and a growing middle class enamored with the idea of owning a car. Strewn across both sides of the Guayas River, and occupying several islands in the river itself, the metropolitan area’s transportation infrastructure is straining under the ever-growing number of cars. Only one major bridge, the National Unity Bridge complex links downtown Guayaquil with the upscale neighborhood of Samborondon to its north and the working class and bedroom community of Durán to the east. A “normal” commute from Durán to downtown takes at least an hour. During rush hour or if there is an accident on the bridge, forcing traffic to smaller bridges to the north, commutes can be double or triple that time. In addition, demand for onstreet parking has increased traffic levels as cars seek parking in both ends of the commute. With Ecuadorian government coffers empty due to the fall of oil prices (one of its major export commodities) and ongoing recovery efforts from the disastrous earthquake in April 2016, little or no help was forthcoming from the central government. The progressive mayor of Guayaquil Jaime Nebot faced this dilemma and explored a number of traditional and alternative transportation options. The idea of expanding roadways and building additional bridges was considered but discarded early on due to disruption, time and expense. Instead, Nebot’s government focused on some interim measures such as building the “Zig-Zag” pedestrian bridge and expanding bike paths. Measures to expand public transit were implemented, but constricted highways continue to blunt their effectiveness. Guayaquil decided to attack the demand side of these transportation challenges by constructing an “air bridge” across the Guayas River, thus reducing, or at least delaying, the need for future highway construction. The “Aerovia” will be an urban cable car system, similar to the technology used in ski lifts, but modified to be faster and more heavy-duty. Also known as “ropeways”, these conveyances are increasingly being applied as Automated People Mover (APM) systems where logistics make traditional highway or rail applications difficult and/or expensive. The city has awarded the USD$134 million contract for the Aerovia to the consortium Aerosuspendido Guayaquil, made up of the companies Poma S.A. and Sofratesa. France’s Poma Group has vast experience in cable transport. Poma has built more than 8,000 installations in more than 80 countries, according to its website. 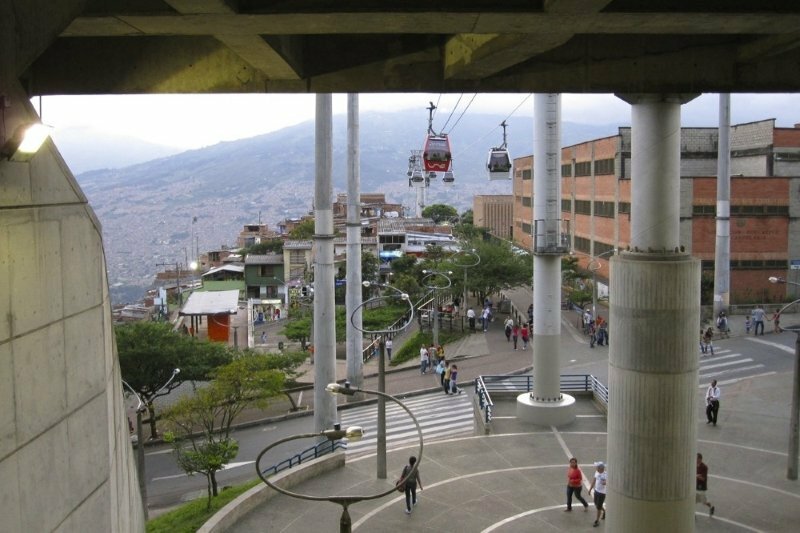 The contract covers only the first phase of the cable car system, from downtown Guayaquil to Durán. A second phase, linking Guayaquil to Sanborondon, is expected to follow. The costs of operation and maintenance of the Aerovia transportation system will be at the sole expense and risk of the operator, which will charge a “reasonable” fare. Guayaquil’s Ministry of Transit Operations (ATM) expects 40,000 persons to utilize the system per day. Projected over the Aerovia’s life of 30 years, the cost to Guayaquil projects to approximately USD$.30 (2017 dollars) per passenger moved. Financing for the project was provided by the French National Development Agency, an arm of the French government, which funds sustainable projects in developing nations. With French financing now in place, the first phase of the airway will be built, comprising the Guayaquil-Durán section. Construction is slated to begin in late 2017. Important to the end goals of mobility management is how the endpoints of the Aerovia will be accessed by persons arriving by foot, transit and vehicle. Roadway improvements, pedestrian/bike paths and parking facilities are yet to be determined.